How to forward a domain on the Cloudflare platform. – and one of their latest awesome service additions is the ability to use Cloudflare as domain registrar, with super-low wholesale domain pricing. Nice. 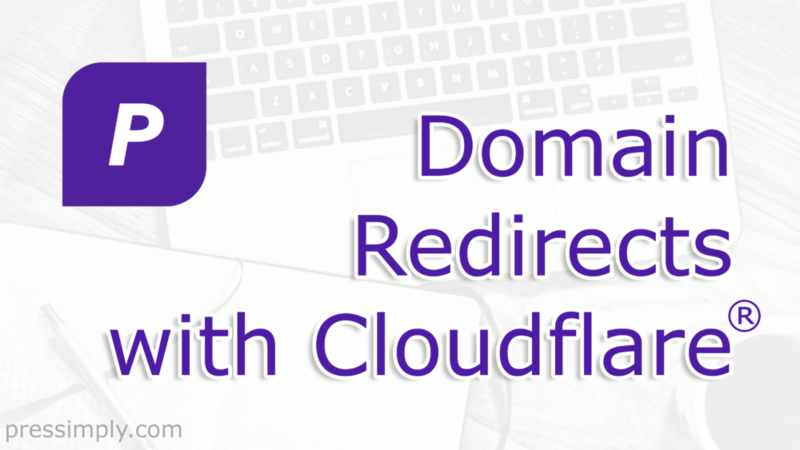 While you don’t need to be using Cloudflare as registrar for this to work (any domain on the Cloudflare platform will function in the same way, as they are providing your DNS), we found out how to do it after transferring our domain registrations over to Cloudflare Registrar. Prior to that, we were forwarding domains using our old registrar’s system, which is pretty normal. Common practice in brand protection is to register your branding with several TLDs (Top-level domain : the bit that comes after the dot, like .com or .co.uk). If you have several domains like this, you’ll most likely want to forward these additional domains to your primary domain. Here’s how this is done in Cloudflare. First off, setup the domain you need to forward in Cloudflare. Make sure you have an A Record (or AAAA if you’re in IPv6 land). It really doesn’t matter where this points (we tried it with 1.2.3.4, as a test) but for problem-free setup, we’d recommend the IP address of the domain you’re redirecting to. – and add *mydomain.com* with a 301 code (a permanent redirect) pointing towards https://mynewdomain.com as your Forwarding URL. Thoughts or comments… ? Say hello.